There were 658 press releases posted in the last 24 hours and 153,559 in the last 365 days. 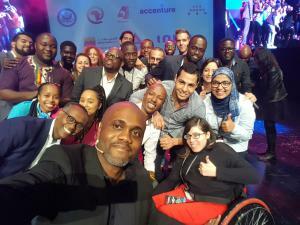 The 7th edition of the Pan African showcase concludes in Casablanca, Morocco and the five selected winners will be heading to Silicon Valley next year. PALO ALTO, CA, UNITED STATES, October 23, 2018 /EINPresswire.com/ -- Over four full days of thrilling ecosystem activities, the 7th edition of DEMO Africa closed with a beautiful ceremony at the Studio Arts des Vivants in Casablanca, Morocco and the five winners for the 2019 edition of the Lions@frica Innovation Tour in Silicon Valley were announced. For a conference that has traveled all over the African continent and landed in the North African region, this year's edition of DEMO Africa gave a wonderful opportunity for the Moroccan entrepreneurial ecosystem to play host to a powerful international network and attracted a global audience of innovation and investment stakeholders. Sponsored by Lions@frica and Microsoft alongside a stellar lineup of local and Pan-African partners including, but not limited to, Accenture, inwi,Ensias and Atijjariwafa Bank,the annual showcase was also a unique celebration of the regional growth of the North African startup ecosystem.The event was also streamed live on the global network of the Voice of America (VOA) by the wonderful host of the VOA Upfront Show, Jackson Mvunganyi. The five selected startups are: Chefaa(Egypt), Khourtim(Morocco), VertoFX(Nigeria), Hawkar(Tunisia)and Complete Farmer(Ghana). "This year presented us with a stellar lineup of startups from all over the continent, and we are quite proud that the cohort showcased the ingenuity of young African entrepreneurs." commented Stephen Ozoigbo. "Every year,DEMO Africa finalists get the chance of a lifetime when they showcase their innovations during the main event. They also get global exposure by networking with corporate acquirers, trade and mainstream media, venture capitalists, angel investors and other entrepreneurs attending the conference," remarked Harry Hare. The five winners will join a league of international startups in Silicon Valley for the 2019 edition of the Lions@frica Innovation tour and continue to advance various aspects of their venture creation activities. "We are delighted about the opportunity that DEMO Africa has presented to Complete Farmer and our colleagues. The conference was a great opportunity for our business to make the types of connections that we did. I am also very happy to be one of the startups on the Lions@frica innovation Tour in Silicon Valley. The opportunity is overwhelming and my team and I are gearing up for it." - Desmond Koney, Complete Farmer. In addition to the announcement for the five winners, all of the thirty startup finalists were fast tracked to the Technical Review stage of the Innovation Impact Grant Program organized by the Dubai 2020 Expo Live in an announcement by Jana Elkova, Project Manager Expo Live Grants & Innovation Programme - Expo Live. Furthermore, three of the startups - Toufoula Kids (Tunisia), Hawkar(Tunisia) and WeflyAgri(Ivory Coast) also won the awards from the French Development Agency (DFA) and will be attending the 2018 edition of the Emerging Valley & Social Inclusive Business Camp, under a full scholarship from the DFA announced by Samir Abdelkarim of Startup BRICS. DEMO Africa 2018 was also rich with side events and quality keynotes, fireside chats and panel discussions. As part of the pre-DEMO activities, the thirty startup finalists participated in a two-day bootcamp to deepen their knowledge and understanding of the business ecosystems and venture environments. Select investor attendees also participated in the Angel Investor Summit and Investor Round-tables that brought together investors from all across Africa, and the global venture capital community, alongside innovation partners and public sector representatives from across the continent to exchange best practices, frame policies at a regional level, share lessons learned and guide the trajectory for early stage investing across the continent. "I had the privilege to attend the Investor Summit and also sit on one of the jury panels at the main event, with startups from Ghana, Tunisia and Nigeria pitching: amazing experience, great privilege, and definitely a must-do in 2019 to promote our NTF4 tech startups from Senegal and Uganda. Led by Thomas Debass, Acting Special Representative for the U.S Department of State's Office of Global Partnerships, the inaugural African Future of Infrastructure Summit at DEMO Africa 2018 also presented a one of a kind convening of infrastructure stakeholders that were willing to share thoughts and compare notes on the the current state of the African infrastructure landscape and explore opportunities for development. The Summit was the first in a series of African Future of X convening that is designed to foster public private partnerships aimed at shaping how emerging technologies would impact the future of Africa. DEMO Africa 2018 also featured the first ever DEMO Africa AI Meetup. Led by Alex Tsado of the African Technology Foundation and NVIDIA, the meetup featured researchers, professors, investors and industry practitioners that have embraced AI as an economic tool and are keenly interested in the direct implementation of AI within the African technology ecosystem. The annual DEMO Africa event is one of the flagship initiatives of LIONS@frica, a public-private alliance aimed at enhancing and deepening the start-up and innovation ecosystems of targeted fast-growing African economies. The 2018 edition of the annual showcase was a success and we look forward to gathering global technology luminaries once again in about a year's time for DEMO Africa 2019.